Tour the land of the long white cloud with New Zealand's clearest mapping. This small format atlas has more than 1500 motorhome parks, camping grounds, wastewater disposal sites and adventure activity locations marked. Additional city and national parks maps offer something fo... read full description below. 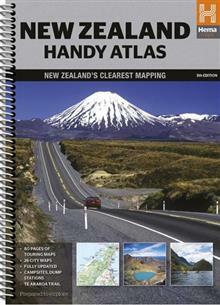 Tour the land of the long white cloud with New Zealand's clearest mapping. This small format atlas has more than 1500 motorhome parks, camping grounds, wastewater disposal sites and adventure activity locations marked. Additional city and national parks maps offer something for every kind of traveller, while a succinct trip planning section simplifies the preparation and research stage for any New Zealand adventure.